Gallup's Job Creation Index finds job growth essentially unchanged for the third consecutive month, with a score of +7 in July -- about on par with +8 in June and +7 in May. Job market conditions are better now than they were during the financial crisis at this time a year ago (-2), but remain far below the already-recessionary levels found at this point in 2008 (+20). In July, 28% of U.S. workers reported that their companies were hiring, halting the consistent upward trend found from February to June. From a longer-term perspective, hiring reports are up substantially from the same period in 2009, but still below hiring levels at this time in 2008. Twenty-one percent of U.S. employees report that their companies are letting people go -- unchanged during the past four months. Workers' reports of people being let go in July are down five points from July 2009 but remain five points above July 2008 levels. Unfortunately, Gallup does not say actual numbers of people hired or fired, only that a company is hiring or firing. A company firing one worker is as significant as another company hiring 200 workers. Gallup also fails to incorporate new business creation as well as death of new businesses. Of course the BLS "birth-death" model is one of the things many like to complain about, including me. I bring these points up because it is important to understand the potential flaws in the data being reviewed. It would have helped if Gallup broke out results by company size, as well as some order of magnitude as to hiring and firing. 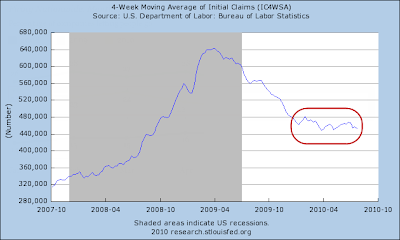 We do have an alternate handle on firing however, simply by looking at Weekly Unemployment Claims. 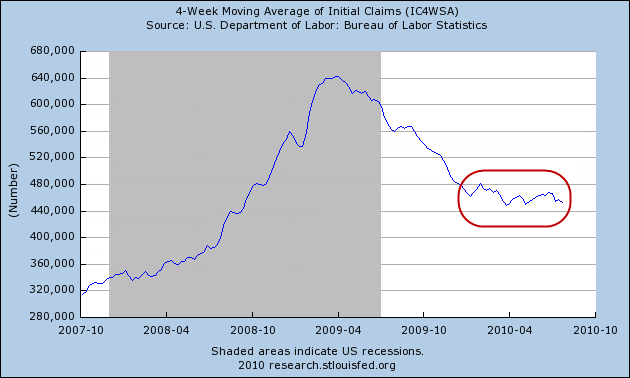 The above chart shows no improvement in weekly claims for going on 8 months, dating back to mid-December. That chart is roughly in agreement with the relatively flat Gallup line on the percentage of companies firing workers. A recent Gallup poll on small business conditions strongly suggests small businesses are not going to ramp up hiring plans anytime soon. The Future Expectations Dimension of the index, which measures small-business owners' expectations for their companies' revenues, cash flows, capital spending, number of new jobs, and ease of obtaining credit fell 13 points in July to -2 -- the first time in the index's history that future expectations of small-business owners have turned negative, suggesting owners have become slightly pessimistic as a group about their operating environment in the next 12 months. Americans' economic optimism declined from 41% at the beginning of May to 30% in mid-July before ticking up to 33% over the past couple of weeks. Percentage of Consumers Saying Economic Conditions are "Getting Better"
I commented at length on Bernanke's assertion in Bernanke Says Economic Outlook is "Unusually Uncertain", Fed Prepared for "Actions as Needed"
In my opinion the Fed is enormously and erroneously overoptimistic about its assessment of the economy, especially unemployment. The odds we get back to 5% unemployment anytime soon are close to zero. And unless the participation rate collapses, we are far more likely to see higher highs, possibly above 12% before we start to see the rate drop. Be Prepared for "Unusual Actions"
The Fed seems to be sensing it may be wrong in its optimistic assessment judging from Bernanke's "Unusually Uncertain" statements. Risks are not just "skewed" to the downside, they are enormously skewed to the downside. Hyperinflationists will be coming out of the woodwork on the Fed's statements today. However, I calmly note that Bernanke has met his match: consumer attitudes. We have reached a Consumption Inflection Point - No One Wants Credit and consumer spending plans have plunged. There is nothing Bernanke can do to "fix" that. Besides, there is nothing to "fix" anyway. Boomers headed towards retirement better be saving more and spending less. The same applies to kids out of college without a job. Finally, I note that Bernanke thinks consumer spending is on the rise. It's not. Bernanke needs to get out in the real world and see what's happening. He can start by reading Rockefeller Institute Confirms Rising Retail Sales a Mirage. The Gallup Poll suggests consumers are not about to go on a spending spree. This is a matter of common sense.